(Cherry Hill, N.J.) – Cherry Hill Township has released its 2014 Summer Arts & Entertainment schedule, which features a new moonlit trail hike, a free outdoor opera, and the expansion of the popular Music Under the Stars concert series. Festivities begin on Friday, June 13, with a free Full Moon Hike along the Croft Farm Nature Trails, and will culminate with the inaugural Cherry Hill Restaurant Week from Aug. 10 to 16. Not included in this year’s schedule is the Township’s July 4 fireworks display, which was removed due to safety concerns. Crowd size had grown beyond the capacity of the field at Cherry Hill West, and no other venue in town could safely house the event. The expansion of events coincides with July’s celebration of National Parks and Recreation Month, and a number of this summer’s events have been scheduled to highlight some of the community’s greatest assets, including 52 public parks and playgrounds, 10 miles of trails, and the historic Barclay Farmstead and Croft Farm, which are home to two nationally recognized trail networks and serve as the backdrop for some of the year’s largest events. Below is a complete listing of this summer’s events and activities. For additional information, check out the Summer 2014 Community Magazine, which arrived in homes in May and can also be found online at www.CherryHill-NJ.com/recreation. For questions about any of these programs, contact the Department of Recreation at (856) 488-7868, or email Events@chtownship.com. Join us on the Croft Farm Nature Trails for a hike under the full moon, led by members of the Cherry Hill Environmental Board! The evening will kick off with a live demonstration from the Cedar Run Wildlife Refuge, giving families a chance to meet some nighttime visitors up close. Following the hike, enjoy s'mores around the campfire and live music. Bring your flashlights and explore our trails from a new perspective! The Cherry Hill Arts Board presents live entertainment and lunch for residents 55 and up throughout the year. Seating for both summer concerts is limited; tickets are $5 in advance, or $8 at the door. Tickets can be purchased using the form in the Summer 2014 Community Magazine, or in Room102 of the Township Municipal Building, 820 Mercer St. Enjoy a lively blend of music from the 1940s-60s, along with a pizza and salad lunch. Enjoy a hot chicken lunch as you listen to the Sounds of Summer with a Motown flair. 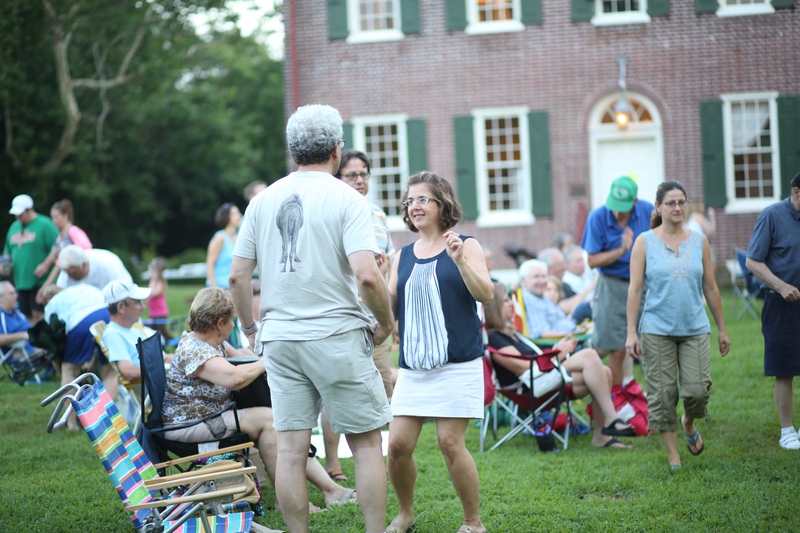 Headlining this year’s summer lineup is the return of Music Under the Stars at Barclay Farmstead, a free summer concert series featuring live, local music on the grounds of one of the Township’s historic properties. The series has been expanded to five weeks this year, giving residents an additional opportunity to enjoy a warm summer night outdoors. Guests are invited to bring blankets, chairs, and even a picnic dinner, to settle in for the evening’s opening act and headliner. Local food trucks will offer on-site dinner options, while the Friends of Barclay Farmstead will offer free guided tours of the Farmhouse. Concerts are canceled in the event of rain. Music Under the Stars is supported by NFI and Republic Bank. •	July 1: Don’t Call Me Francis! Kick off the summer with this high-energy, get-up-and-jam type of band. You’ll be dancing in no time! Enjoy Classic Rock, Pop and Blues from the 1950s, ‘60s and ‘70s. From soft ballads to toe-tapping, foot-stomping dance music, travel down memory lane with your favorite Doo Wop, R&B, Motown, Country and Pop from the 1950s, ‘60s and ‘70s. This Musical Duo’s repertoire spans Classic Rock, Pop and Country from the 1970s to today. The Mango Men close out this year’s series with the tropical sounds of Jimmy Buffet and other island favorites. Cherry Hill Township is excited to partner with Camden County to host a special outdoor performance of Romanza, performed by the New Jersey State Opera. Bring a blanket and a chair and enjoy the music of romance and love! From Aug. 10 to 16, the Township will host its inaugural Cherry Hill Restaurant Week, giving residents access to the best of Cherry Hill’s culinary landscape at a special price. Participating restaurants will offer patrons a three-course prix fixe dinner menu ($25 or $35), with lunch options available, as well. This year’s participating restaurants include Farm & Fisherman, Toscana, Dream Cuisine, Seasons 52, Caffe Aldo Lamberti, Tutti Toscani, Brio, Il Villaggio, Ponzio's, Kaminsky’s, The Coastline, Red Lobster, Steak 38 and Dubh Linn Square, among others. Cherry Hill Restaurant Week is sponsored by NFI and supported by the participating restaurants. Look for more information, including a Restaurant Week website and social media pages, later this summer. The Friends of Barclay Farmstead present free, guided tours of the historic Barclay Farm property on the first Sunday of every month from March through November. First Sundays also feature a free, family-friendly craft activity from 1 to 3 p.m. Admission for these monthly tours is free for Cherry Hill residents, with special rates available for non-resident seniors and students. In addition to tours of the farmhouse, visitors can enjoy and explore more than 30 acres of preserved land surrounding the farmstead, including a playground, community gardens, a picnic area and nature trails. Cherry Hill Township and Keswick Cycle invite you to the 2014 Mountain Bike Skills Clinic Series at the Kresson Trails, Kresson and Springdale roads. This successful program has helped nearly 200 riders improve their bike-handling skills, while enjoying and learning about Cherry Hill’s Kresson Trails. Whether you’ve been riding for a day or for years, the clinics are designed for anyone who wants to pick up or fine-tune their off-road riding skills, with a focus on the fundamentals of mountain biking, including basic bike set-up, riding techniques, and trail essentials such as repairs, etiquette and equipment selection. More advanced skill sets will be added as participants progress through the year. Come once, or as many times as you would like; instruction is provided by experienced cyclists under the direction of a National Mountain Bike Patrol certified instructor. Helmets are mandatory. E-mail Jay Jones at chtrailcrew@gmail.com to register, or for more information. In addition to these organized events, the Township promotes healthy activity all year long through its Mayor’s Wellness Campaign. Visit www.CherryHill-NJ.com/wellness for a list of free and low-cost activities and events hosted by the Township and various Wellness Partners across town. For more information on programs, events and activities hosted by the Township, follow the Cherry Hill Recreation Department on Facebook, @CHT_Rec on Twitter, and CherryHillRecreation on Instagram.